After months of preparation, the first of what could be 5,000 Hmong refugees arrived at Twin Cities International Airport Monday night. They were greeted by dozens of relatives in a tearful, but joyous, reunion. St. Paul, Minn. — Just before 8 p.m. Monday, a buzz rippled through the crowd waiting near the baggage carousels. More than 30 members of Chong Thao's family gathered, carrying American flags and flowers. They were there to greet Thao's two sisters and their families, who were arriving from a refugee camp in Thailand. They were smiling, chatting with other relatives and reporters. The sense of anticipation built as the minutes passed. Finally, Thao and the rest of the family saw the sisters descend the escalator -- and they erupted in cheers and applause. Thao burst into tears. And the hugs seemed endless -- there were 11 new arrivals, including seven children. Thao's family is among the first to be resettled in the United States since the U.S. State Department made the decision last December to allow Hmong refugees to move here from a camp in Thailand. Fourteen others who also arrived Monday went to different parts of the country. Speaking through a translator, Thao's brother-in-law, Sxu Seng Xiong, said he could barely express his emotions. "I'm happy and content beyond words, and I'm so sorry it took me this many years to get here," said Xiong. "We could have come here a lot earlier. That's the only thing I regret, is we should have come a lot earlier and not after all these years." Xiong's family had lived in a refugee camp north of Bangkok for more than a decade -- a poverty-stricken area with no running water, no electricity and little food. But, again, through a translator, Xiong said he's ready to put his regrets behind him and begin a new life in St. Paul with his wife and seven children. "The first thing for me is that I need to find a job, so that I can feed and provide for my family," said Xiong. "I know it will take a while to learn the language, but I'm willing to do anything to feed my family right now, gardening or something where I don't have to speak the language. The most important thing is for me to be able to provide for my family." The process to help Xiong become self-sufficient begins immediately. He and the others are expected at the refugee resettlement agency International Institute for an orientation. John Borden of International Institute says they've got a lot of work to do. "We'll go through all their immigration papers to make sure that they're in order. We'll file papers for Social Security applications. We'll issue checks so that they can go right out and buy some clothing, and items that they need," Borden says. "We'll discuss what their obligations are going to be, what our phone numbers are, ask them questions and answers about the community, and set up another appointment for a more detailed orientation." The process must start quickly. The federal government gives each refugee assistance -- but only for 90 days. After that, Xiong may be eligible for social services. But he'll also rely on family members here. 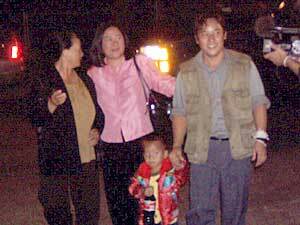 For now, he'll be living with Chang Thao and her family in a small house on St. Paul's east side. It's going to be crowded. The 11 new guests join the eight people who already live in the house. But they've made provisions for Thao's children to move in with other relatives for a few weeks until she finds another place for the new arrivals to live. But before any of that happens, Thao prepared a huge welcome dinner for her relatives. They trekked to the house where even more family members were waiting to welcome them to America. A U.S. Embassy official said about 4,000 Hmong are expected to arrive in the United States by Sept. 30, and that the remaining refugees approved for resettlement will arrive by the end of the calendar year. About 15,000 Hmong refugees are expected to be admitted to the U.S. under the program. The Hmong assisted the United States during the Vietnam War, when they were recruited by the CIA in the fight against communist rebels in Laos. More than 300,000 Hmong, fearing retribution after the communist takeover in 1975, fled to neighboring Thailand, where about 15,000 remain. Tens of thousands were sent back to Laos and others were resettled in third countries, particularly the United States. Small groups of Hmong continue to fight the government in the jungles of Laos. About 1,600 of the Hmong want to go to Wisconsin, while smaller numbers have indicated they would go to North Carolina, Ohio, Rhode Island, Michigan, Oregon and Washington state.